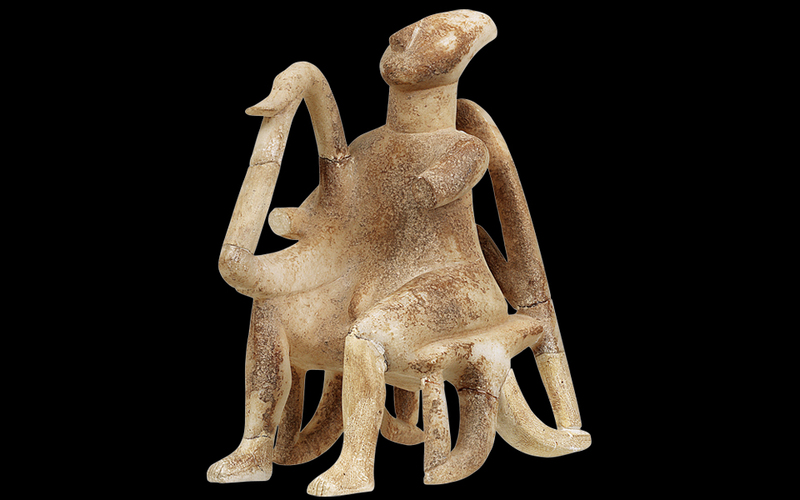 An engaging marble figurine of a seated musician (Early Cycladic II period), from the island of Keros, southeast of Naxos. The intricate carving is made from one piece. 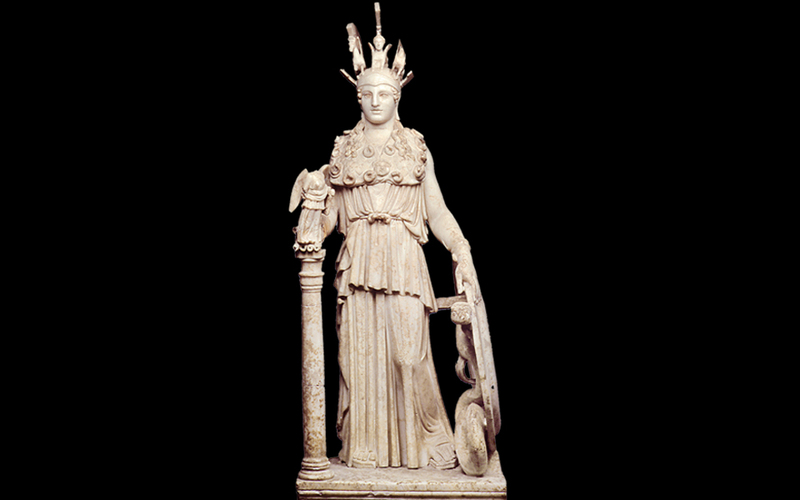 (Hard to find: ask one of the friendly guards) Standing a diminutive 1 m tall, this Roman version of the original gold-and-ivory Athena in the cella of the Parthenon (12 times larger) was discovered in central Athens in 1880 and represents “the most faithful and best preserved copy” of Pheidias’ now-lost cult statue erected in 438 BC. A delightful group, discovered on Delos island, in the House of the Poseidoniasts, a brotherhood of businessmen from Beirut. 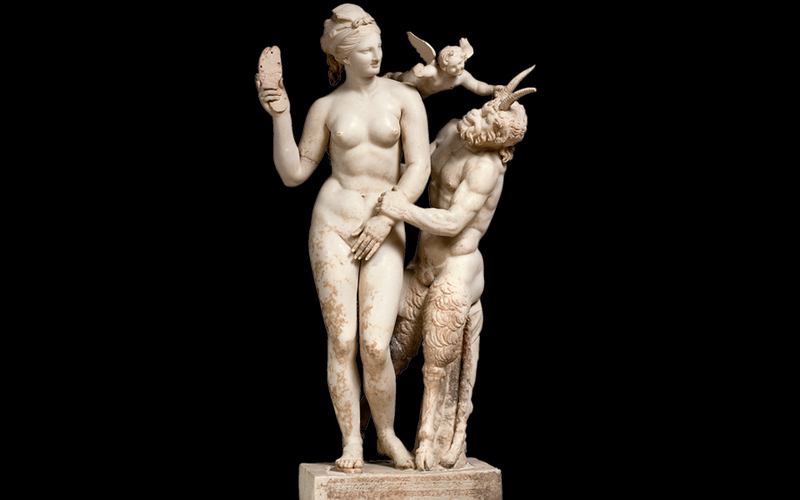 It exhibits all the whimsical humor, elegance, sexual playfulness and mythological fascination that we so often associate with the ancient Greek world. 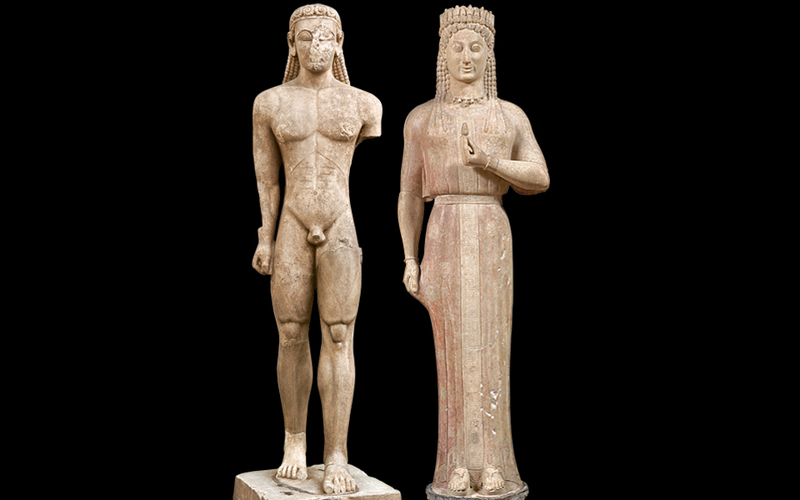 Both discovered in Attica, they reveal the marked difference between early depictions of men and women in Greek sculpture. Note the Kouros’ bizarre ears, and the elegant “Archaic Smile” of the Kore, who holds a flower or fruit intended as a votive offering. 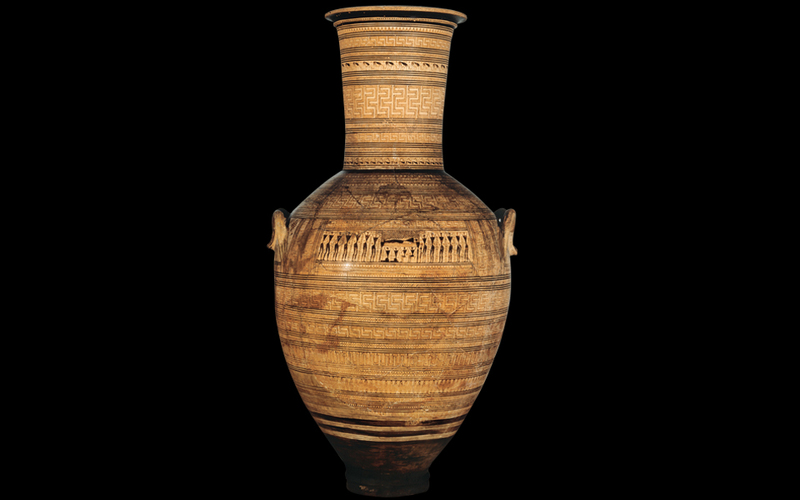 Discovered by Heinrich Schliemann on November 30, 1876, in Grave Circle A at Mycenae. Whether authentic or a 19th century fake, this is truly an impressive face, complete with bushy eyebrows, handsome nose and handle-bar moustache. In the same gallery, also note the scale models of stoutly-walled Mycenae and Tiryns; the fine daggers inlaid with silver and gold; and the boar’s-tooth helmet. An imposing grave marker from the Geometric era, decorated by the Dipylon Painter and found at ancient Athens’ Kerameikos Cemetery. Note the funeral scene, with the deceased lying on a bier in the center, and mourners holding their hands on their heads or tearing at their hair in grief. 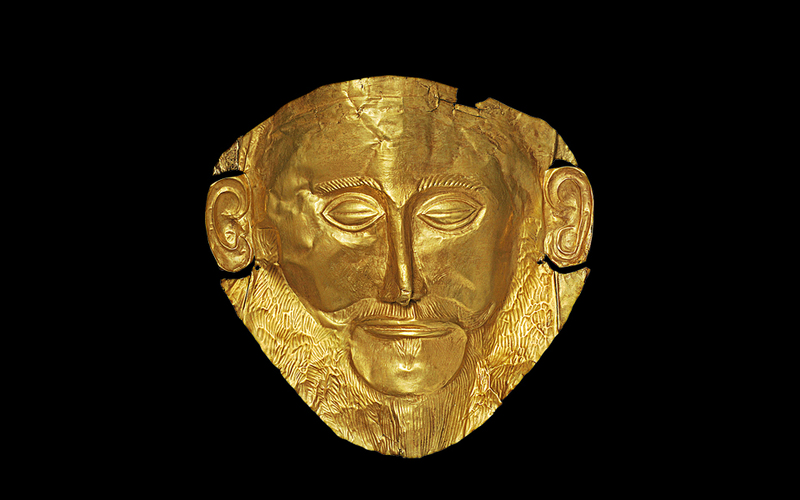 From marble figurines and elegant statues to the golden mask of Agamemnon, they are all here waiting for you to explore them.